Are you struggling to get the perfect medical school personal statement so you can get into medical school but you're unsure of how to write about and how to convey your unique qualities to the admissions committee? Struggling on how to get started? Unsure if your medical school essay is good enough? Having the hardest time talking about yourself? Should you talk about that "bad" grade on your transcript? If you're confused about any of these you're not alone. I've worked with hundreds of premeds who all struggled with how to live in 5,300 characters while at the same time making the strongest case of why they should be admitted to medical school. Let me tell you about Joanna. She also struggled tremendously with writing her medical school personal statement before coming to me for help. She was in your shoes and thought she had a good medical school essay - but I was able to quickly point out the common pitfalls premeds write about. Luckily, she took everything I said to heart and now she is living her dream as a medical student at Case Western Reserve University School of Medicine. Here’s what I taught Joanna to help her write a medical school personal statement that would lead to an acceptance letter. Do you know the biggest mistakes? Your personal statement is not a resume in process. What this means is do not simply retell AdComs your extracurricular activities in paragraph format. You have a limited amount of space to sell yourself to the committee and there’s a reason why we ask for a personal statement. We want to get to know who you are as a person. This is your opportunity to come alive and tell us things about you that we cannot find anywhere else in your application. One of the biggest gripes AdComs have is that students are not personal enough in their medical school personal statement. Oftentimes, students are confused by what this means. It doesn’t mean you share details about your life that would be embarrassing instead you need to let us, the reader into your life and get a glimpse of what motivates you. I tell students by the time I am finished with your essay you should make me want to meet you in person. If you are not able to do this then you’ve failed in writing a convincing essay about getting into medical school. Another common mistake students make is trying to accomplish too much in their medical school personal statement. You do not need to give us a chronological timeline of all of the most significant events in your life. You only have 5, 300 characters so choose wisely. It is much better to focus on only 2-3 topics and cover at depth then try to write about everything under the sun. As a reader this gets confusing and makes your essay seem very disjointed. Here are topics premeds write about all the time that will totally kill your medical school personal statement. We understand you shadowed Dr. Jones and he embodies all the qualities of a warm, competent and compassionate doctor. But remember you are writing about why you should be admitted to medical school and not a glowing review of Dr. Jones. If you see yourself headed down this path stop immediately. The medical school essay needs to be about you. Medicine and science go hand-in-hand. If you are going to tell me you took an anatomy class or any of the sciences and just fell in love with the subject and the intricacies of the human body we’ve seen this a million times. It will not move us. This is not original and we would expect as budding medical students you would have an appreciation of the sciences. Finally, if you are pursuing medicine we know that education must be an important quality. Do not for one second believe you are unique in having parents who are immigrants, who worked very hard and advocated education. This is not new to the admissions committee and plenty of students admitted to medical school are first generation college graduates or medical school applicants. These are some of the most common topics I’ve encountered while helping premed students craft an essay for medical school admission. You may think it’s unique and positions you as special but to an AdCom we see these statements everyday. Instead of talking about these topics I encourage you to pick a theme that you can use throughout your essay while incorporating different aspects of your life all the while making the strongest case of why medicine and why you. If you have a theme to your essay it will be very easy for your reader to follow along and will help you stand out from everyone else applying to medical school. Just by applying the principles I outlined above you are going to be years ahead of everyone else applying to medical school with their drilling and uninspiring medical school essays that do nothing to get closer to a medical school interview. You do remember that the whole purpose of your medical school personal statement is to get the admissions committee to meet you in person by offering you a medical school interview! When Joanna began applying a theme to her medical school personal statement her essay started to come together effortlessly and was a solid mix of making a strong case of why she should be admitted to medical school but did not come off as cocky or arrogant. There’s a fine line you have to balance. After working with me on her personal statement Joanna had a problem: attend the exclusive, private medical school with huge name recognition or attend the public, state school that was willing to give her a full scholarship. Now, I call that a good problem to have. This may seem crazy but Joanna is not my only success story, I have a 100% success rate with the students who I work with on their medical school personal statement. Looking at my numbers this would be over 30 students who’ve been lucky enough to work with me and then gone one to live their dreams as a newly accepted medical school student who is just four years away from being a doctor. If you’d like to discover the step-by-step process that diamond in the rough premed students are using to catapult themselves to the top of the admissions pile by writing their way to medical school then my personal statement editing system is just what the doctor ordered. There’s a proven system to use in writing a personal statement from the opening sentence, to the meat of your essay and finally a strong recap where you position yourself as the no-brainer applicant to be admitted by projecting your acceptance on the reader. 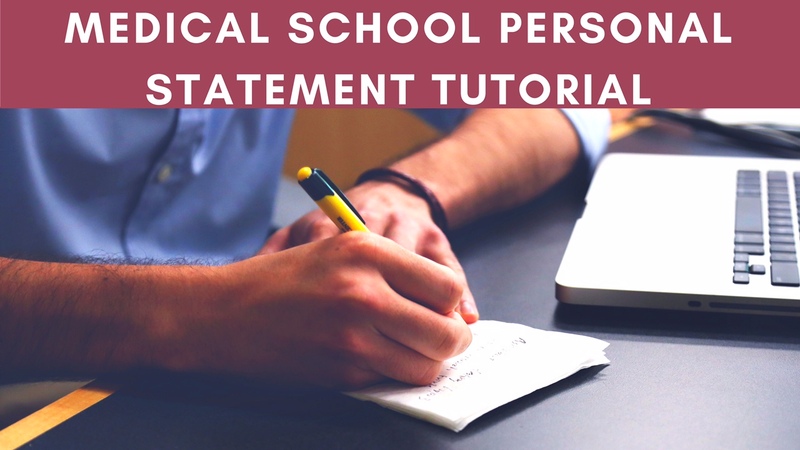 If you would like to discover how each step works and how you can apply this framework to your personal statement, then click here to get “Writing the Perfect Personal Statement for Medical School Admission Success” which reveals the exact process you can follow when you stare at that blank computer screen, not sure how to begin. Don’t delay, don’t procrastinate, you need to take action now. Sure you can wait until it’s closer to your application deadline but there’s no guarantee I’ll be available to personally edit your essay. Appointments get booked up fast. Then you’d be left to your own devices or dare I say even finding some random person online to “check” your personal statement. I wouldn’t leave my medical school future in the hands of someone who just happens to be in some online forum and agrees to give your essay a once over. You worked too hard, and for too long to leave anything up to chance at this point in the game. Not to go all doom and gloom but applicants have been rejected from medical school despite having a strong GPA and high MCAT score due to the contents of their medical school essay. You're a smart, highly motivated student now not the time to drop the ball. Go ahead and discover how you can write your way to medical school and start having medical school options like Joanna, all because you finally figured out the framework for writing a compelling medical school personal statement. Are you ready to write your way to medical school? Would you like to help out with the perfect medical school essay that has AdComs drooling about your application where they have no choice but to invite you to a medical school interview? I can make this happen for you! Work with me and you can be the next premed student who has a medical school acceptance.